Now in its tenth year, the biannual contemporary arts festival, integrated across communities and venues in the city of Liverpool, has become a regular fixture on many an art calendar; least alone in part thanks to the added draw of some of the city’s more or less salubrious pubs and bars! Its inclusion of both national and international artists have made it, in some way, the cultural 'acid-test' of what to expect from contemporary artists working today; the most recent artistic practices, developments, thinking and reaction to some of the current developments and challenges faced in the art world at present. It should come as no surprise that Liverpool, like most of the country, continues to struggle from cuts to arts funding over the last few years (despite this it is reassuring that the festival is still running), but is becoming increasingly reflective of the impacts that lack of funding may be causing. This year’s Biennial feels like a befuddled lack of continuity or criteria from direction of a clear theme or funds needed to bring in curators/artists with this sort of experience OR artists hungry for the exposure that participating in the Biennial would give. 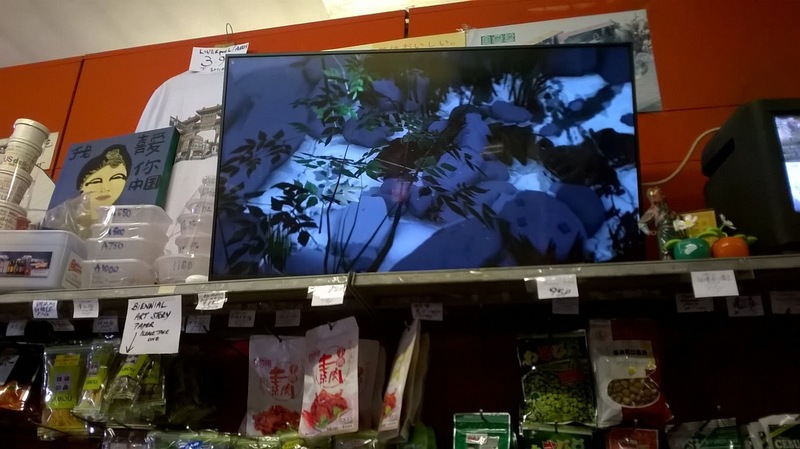 It has in fact been curated by committee into a series of episodes titled, Monuments from the Future, Flashbacks, Ancient Greece, Children’s Episodes, Software, and Chinatown. In short it feels more confused, less defiant and as though it has slightly lost its way in being clear in what message it wants to give; even the Student Protests from 1985, shown in a film and documentation in Open Eye Gallery do little to stir cause for action today or ignite social change. They’re of the past and only seek to act as a comparison at how un-politically motivated and disinterested my generation are often guilty of portraying. I am perhaps stubbornly of the belief that art can act as a platform for self-expression and still have a social or ethical cause or at the very least have some meaning or significance to the present (cinema, seems to do this better than most). All of this is reflected in the choice of artists to display in the Tate Liverpool, classical Greek sculptures amongst Ikea-style furniture and random assorted half-hearted piles of rubbish on the floor (Half-hearted piles of rubbish, as they are too small to have significance and slightly too contrived to look natural). They are the, dare I say, ‘work’ of Jason Dodge who calls the intervention ‘what the living do’ but it sounds like trite to me and doesn’t say anything new about man’s relationship with his waste. I suppose the fact that it annoys me by its being in an art gallery is the point he’s trying to make though it still feels weak for being so subtle and failing to care whether it engages with its audience or not. This being the 2016 Biennial at its worst and many critics pointing out that viewers ‘have to sift through the rubbish’ in this year’s Biennial is an accurate assessment. Visually, Koenraad Deedibbeleer’s use of subtly altered Greek sculpture is interesting but only because they are Greek sculptures, the newly created modern plinths they stand on are somewhat superfluous and don’t really add anything new. If ‘pointlessness is the point’ and that it is in some way reflective of the throw-away, media heavy era we are currently occupying then it feels lazy and somehow unhelpful as it is unclear if it is being critical or supportive. 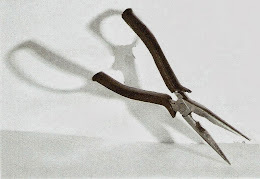 Generally speaking I think I am leaning toward a contemporary art that challenges the status quo rather than adopting it. Upstairs and not part of the Biennial programme of events is the excellent Francis Bacon exhibition that only widens the cynical division between the art of the past and that of contemporary. Why couldn’t the contemporary exhibition have been the better of the two? I think art needs to rise to the challenge rather than take such an apathetic approach. 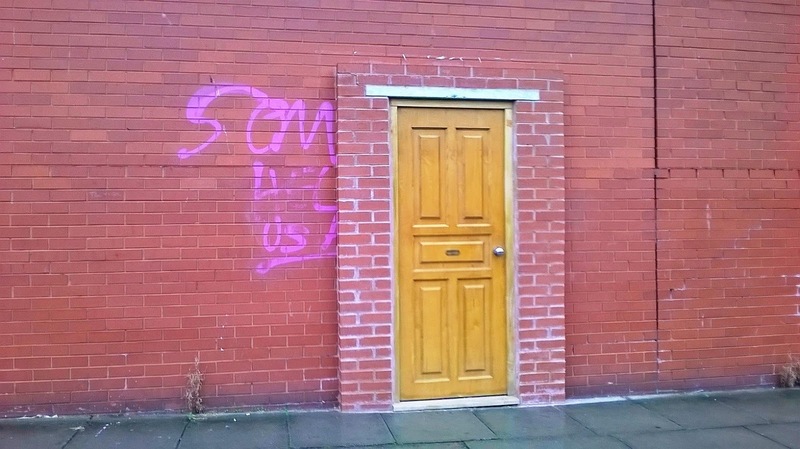 There are however a few glimmers of hope and in what the Liverpool Biennial has always prided itself in doing so well, is opening up unusual or abandoned spaces to artists and allowing the public access to some truly remarkable buildings. This year is no exception and the ABC Cinema, Cains Brewery and Toxteth Reservoir are a few of the gems worth investigating as buildings alone. The greatest success of this year’s Biennial is the integration of the main festival with its inner city areas. 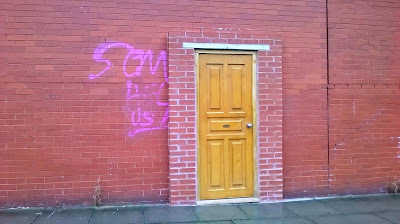 In and around Toxteth there are little signs as to where the City’s European Capital of Culture funding in 2008 was spent and even fewer signs of people or life compared with that of the bustling shopping district of Liverpool One. 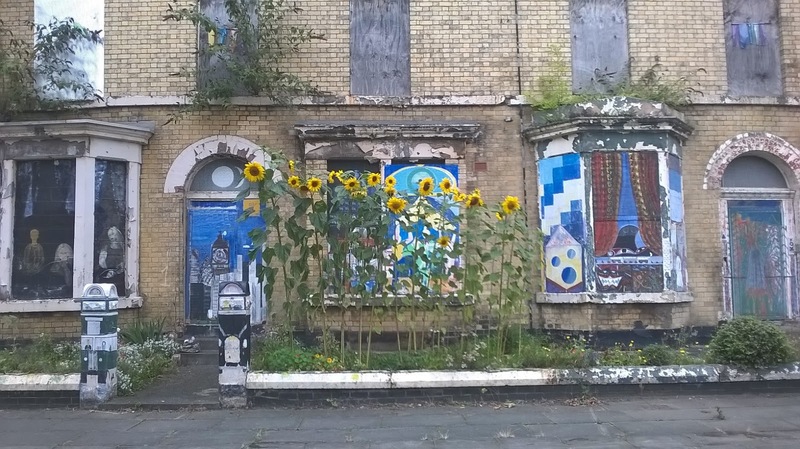 Despite this however, the artists have moved in and are beginning to make positive changes; on Granby Street, Turner Prize winning Art Group, Assemble have been working since 2012 to save the area from demolition through collaboration with the community. Granby Workshop is a social enterprise based there which sees handmade products made and sold by the local people. 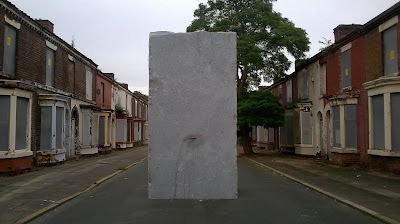 Elsewhere on Rhiwlas Street, Lara Favaretto has placed a 'Momentary Monument- The Stone' in the middle of this abandoned terraced street that looks like something more out of a dystopian horror than England, 2016. After the Toxteth Riots in 1981 many people have been forced to move out of such areas to allow for redevelopment. A redevelopment however that appears to be a long time coming and as result has only led to further decay of much needed houses. Painfully depressing, yet stunningly too, the area is a remarkable ghost-town and is an important reality-check from the ‘pointlessness’ of much of the Biennial art in the centre. Favaetto’s stone stands like a sentient monolith in the middle of this street, part blockade, part gravestone, part Brutalist sculpture, its appeal is in its context. In its unmovable, stubbornness it signifies some of the resistance and confrontation matched by the people whose lives were affected by events that happened here. On one side it has a small postal slot for donations or notes when after the Biennial the stone will be removed and cracked open; its contents distributed to local asylum seeking charities. Just three-hundred metres down the road from this is the impressive Toxteth Reservoir, no longer in use, its purpose in a modern-day Liverpool is yet to be defined. The building slopes upwards with a flat turf lined top and inside is a chamber of arches and steel columns befitting of an atmospheric scene from a thriller or crime drama. 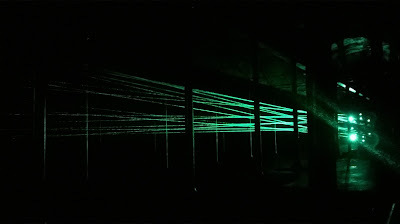 Stepping inside this space viewers encounter Rita McBride’s laser installation consisting of several straight green beams of light, crossing in places, spanning the length of the reservoir. The affect is one of the most visually striking spectacles in the entirety of the Biennial and transforms as well as illuminating the space into something both dramatic and unreal at the same time. The laser beams shimmer under the dampness of this cavernous-like space and the whole thing feels temperate, fragile and in-keeping with some of the uncertainty of what the future holds within this building and area. McBride describes it as a wormhole and its use of green light does give the whole atmosphere a sci-fi feel, but for me it’s the way it works within the architecture of the reservoir that makes it so exciting; the horizontal lines created by the beams in contrast the the verticals of the supporting columns and curves of the bricked archways compositionally makes a lot of very interesting shapes and shadows. This work was created for this space and it’s that level of understanding or site-specific awareness that is missing in so much of the Biennial elsewhere. 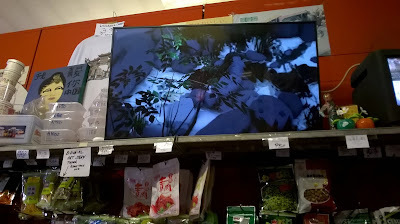 Back in the City centre you’ll find more video art than you could ever hope to see in one place, even along the shelves inside a Chinese Supermarket (pictured)! 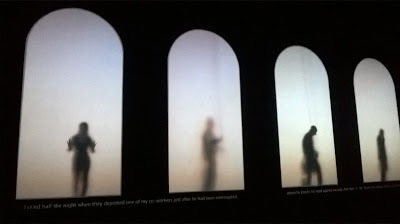 I could almost write a whole piece about the video art in this year’s Biennial alone. Mark Leckey ‘Dream English Kid’ shows a snapshot montage of the cultural events that happened in the artist’s year’s growing-up between 1964-1999. The film has some brilliant moments, amateur footage from an early Joy Division gig sourced from YouTube and close-up, panning shots of vinyl record sleeve that resonate of nostalgia that Leckey’s work tends to do usually quite well. This piece covers so many ideas that it almost ends up saying nothing at all, but perhaps in that way it is more representative in portraying the feeling of memory/memories as a series of glimpses and fragmented layers thrown-together? Which would be convenient for Leckey, but acts more like the work in the Tate and Bloomberg tending to alienate its audiences. If you only go see one film however go see Polish artist, Krzysztof Wodiczko’s ‘Guests’ (2011) at FACT gallery on Wood Street. Projected as a series of life-size arched, illuminated doorways the silhouettes of legal and illegal immigrants in Poland and Italy who animate these doorways in scenes of everyday life in a public square; there is a window cleaner, leaf blower, umbrella seller, parents, children and others. Conversations and actions happen simultaneously with characters occupying and disappearing from their framed windows as passers-by. So watching this film is to read (its subtitled) fragments of conversations about immigration, debates about seeking asylum and the situation of immigration policies and the affects it has on real people and their lives. For projections they look like ghostly Marlene Dumas paintings and is one of the few immersive video installations in the Biennial. Each figure is anonymous so the viewer becomes devoid of any judgments they may bring to the piece; these characters are all simply people. Wodiczko’s other pieces in FACT are given smaller space but deal with some equally poignant issues from homelessness to PTSD amongst American war veterans and is certainly an artist to look out for. Overall the Biennial may feel a bit muddled this year and generally it hasn’t been as good as it was in perhaps its heyday as the Capital of Culture year; though despite this people still keep visiting it and it deserves to thrive if nothing other than for the city and its people who have supported it for so long.